but it doesn’t have to be hard. 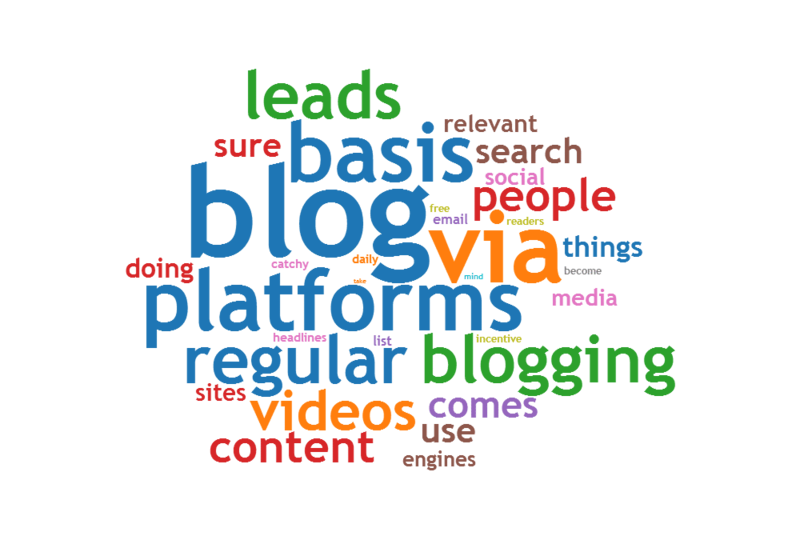 With that said, below are some tips and advice when it comes to generating leads via blogging. Optimize Your Blog Content- One of the first things you should be doing, asides from publishing quality content, is to optimize your blog posts, and this means to use relevant links within your posts, as well as using the right keywords that you think people will be looking for via the search engines. Also, keep an eye out for keyword density, which means you should not overdo it with keywords (the number of times you use it throughout a piece of content). Research keywords that are relevant to your blog, and choose 2-3 low-medium competitive keywords and then use those keywords maybe once per 100-125 words, and the search engines may end up taking notice. Blog Daily- When you want to generate leads with blogging, then you should blog on a daily basis, and make sure your content is informative and engaging. You only need to publish one post per day, and eventually people could end up coming to your blog on a regular basis, and this will increase your chances of getting more leads. If you cannot blog on a daily basis, then blog at least five days per week, and remember to blog with SEO in mind, as this can help you get your blog’s posts a good place in the search engines’ results pages. Use Videos- Another thing you should be doing is publishing videos to your blog, but also make sure you are publishing those videos to 3-5 video sharing platforms, such as YouTube. There are many social media sites that allow you to publish your videos, so publish them there and on your blog. The videos you create should be related to your niche, and encourage people to join your email list, as doing this can bring you in a lot of leads. Many people prefer to watch videos instead of reading content, therefore you should create 1-3 videos per week and publish them to a number of sites, including your own blog. Provide An Incentive- Provide your readers with an incentive to come back to your blog or to signup and become a subscriber to your email list. One of the best ways to keep readers coming back is to offer them a free eBook or even a free course that is provided to them via email. If you give something such as those things away for free, then you should find yourself generating quite a few leads on a regular basis, so make sure you provide readers with an incentive. Use Catchy Headlines And Engaging Content- Your content should be engaging, and as for your headlines, make sure they are relevant and catchy. You want to entice people to share your post on social media sites, and if your content is engaging and has a catch headline, then the chances are people will be more inclined to share it. It may take some practice to generate catchy headlines for your posts, but eventually you will become good at it and before you know it, you will enjoy getting leads on a regular basis. Promote Blog And Posts Via A Number Of Platforms- When it comes to generating leads via your blog, one of the best things you can do is to promote your blog and posts via a number of social media platforms. This means when you publish a brand new post, then you should promote it on Facebook, Twitter, Linkedln and Instagram to name just a few. Ideally, you should promote your blog and posts on at least 6 platforms, but only promote on each platform no more than 2-3 times per week. If you do this, then you could increase the number of leads you get via blogging. When it comes to generating leads from blogging, the above tips can make things easier. Keep those tips in mind and start implementing them as soon as possible. The sooner you implement them, the sooner you will be generating leads from blogging.